Friday 24 July 2009 marks the launch of the new British Racing Drivers’ Club (BRDC) web-site and BRDC Prints, an online facility to purchase the very best prints from the Club’s archive. 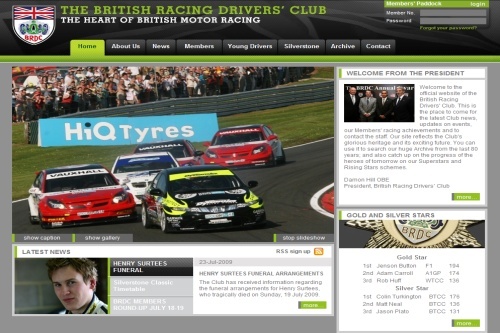 Welcome to the new look BRDC web-site www.brdc.co.uk . As you will see the site has undergone considerable development, both in style and content and I am delighted that you have take the time to have a look at the new site. The BRDC has been at the centre of British motor sport for over 80 years. After 10 years, the Club’s website has been significantly refreshed and enhanced to provide both Members and wider motor sport enthusiasts alike with updated and improved information on the BRDC. In addition to up-to-date standings for the coveted Gold and Silver Stars, news on Members’ success on track and driver profiles, there is history and background on the highly regarded Club. For the Members there is an exclusive ‘paddock’ area information on events, Member offers as well as an on-line store with the coveted Member only BRDC badged merchandise. The BRDC has a wealth of history, much of it previously unseen, in its extensive archive. BRDC Prints is a brand new online photographic print service where those with an interest in the sport can search, enjoy and, if they wish, purchase images from the photographic archive of the British Racing Drivers’ Club. BRDC Prints offers the purchaser a wide range of options from size of photograph and style of frames, to gloss print or canvas with options designed to suit all tastes and budgets. The collection covers more than 80 years of motor racing and reflects both the achievements and history of the Club and its Members. BRDC Prints can be found at www.brdcprints.co.uk and range in price from £6 to £330. For further information on the BRDC web-site please contact Club Co-ordinator Sarah Carnell on 01327 850925 or email sarah.carnell@brdc.co.uk or for BRDC Prints please contact Archivist Steph Sykes on 01327 850927 or email steph.sykes@brdc.co.uk. In the meantime please enjoy both sites – I hope you find them of interest.